Compositing operations determine how a graphic is drawn on top of existing graphics. They essentially determine what equation is used to determine the resulting color of the draw operation. These operations are often called Porter-Duff compositing after the programmers who defined them. In Cocoa, they’re represented by the NSCompositingOperation enumeration and their counterpart in Quartz is CGBlendMode. CGBlendMode was originally just for PDF blend modes, but in 10.5, the compositing operations were added. Note, though, that these new blend modes are not guaranteed to work with PDF CGContextRef‘s, only bitmap ones. NSCompositingOperation is used in several places in AppKit. Most prominently, you can set the compositingOperation for an NSGraphicsContext to determine the operation for subsequent drawing. NSImage also uses NSCompositingOperation in most of its drawing methods. Finally, NSCompositingOperation is used in several graphics related AppKit functions like NSRectFillUsingOperation, and in fact this is related to a common Cocoa graphics problem. 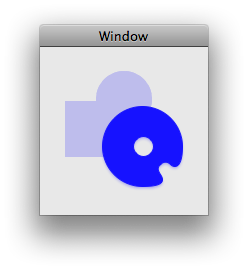 NSRectFill and NSFrameRect both use the NSCompositeCopy operation, which is not the right operation to use when drawing with a partially transparent color. In that case, when the color gets drawn it will me partially black instead of partially transparent. To make sure your rects get drawn right with partial transparency, use NSRectFillUsingOperation and NSFrameRectWithWidthUsingOperation and specify NSCompositeSourceOver (which is generally what you use for “normal” drawing) for the compositing operation. You can explore compositing modes more with Opacity. 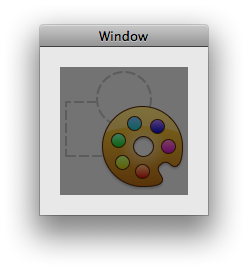 Create an image with 2 or more layers, then select the top layer. Select the Window > Show Layers Info menu item and look at the Blend popup. The top two sections are PDF blend modes, and the bottom section includes the compositing modes. See what kinds of effects you can come up with! This entry was posted on Monday, April 27th, 2009.